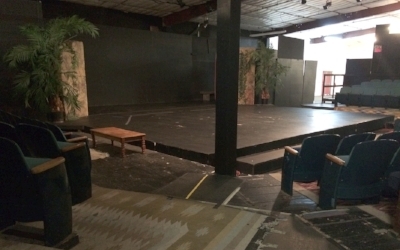 Center Stage is a unique performance space, perfect for staged readings and limited staged productions. The auditorium has seating for up to 150 people, a professional sound system and stage lighting, a 25 x 10-foot raised stage, tons of parking, and several good restaurants within walking distance. The building offers an entrance hall with two bathrooms and an attached kitchen, plus a green room with bathroom. Center Stage not only offers competitive pricing, but also has the equipment for streaming, recording, and producing a CD or DVD. This non-profit organization dedicated to preserving, protecting, and promoting the Hispano art, culture, and traditions of Northern New Mexico is organized as a Center of Hispanic Culture and Learning. El Museo’s programs emphasize participation and inclusion of the entire community. Exhibitions and performances are accompanied by workshops, lectures, and support presentations to promote learning and educational activities. Its programs nurture and support the arts and cultural education, and underscore the value of economic benefits available through the arts. Located in the heart of Santa Fe Railyard property, this 31,000 square foot warehouse facility houses galleries, exhibition spaces, and a theater. There are on-going activities, plus space is available for rent. The creation of this large space was spearheaded by James Little, a superintendent for the New Mexico School for the Deaf in the late ’70s/early ’80s who wanted the students at NMSD to have a performance space where they could learn about the dramatic arts; through the Technology & Arts program at NMSD, still today students learn about reading scripts, backstage and set-design skills, stage production, as well as performance and improvisation. The theatre has served the greater Santa Fe community for more than thirty years. Meow Wolf is an arts production company that creates immersive, multimedia experiences to transport audiences of all ages into fantastic realms of storytelling. Our work is a combination of jungle gym, haunted house, children’s museum, and immersive art exhibit. This unique fusion of art and entertainment gives audiences fictional worlds to explore. The Meow Wolf Art Complex is home to Meow Wolf’s first permanent installation, House of Eternal Return. The Santa Fe Playhouse mission is to preserve and advance our legacy as the oldest continuously running theatre west of the Mississippi, while nurturing and providing quality theatre and performance for everyone. Our vision is to be the driving force in establishing Santa Fe as a destination for quality engaging theatre. Teatro Paraguas promotes literature and theatre through English, Spanish, and bilingual presentations of contemporary Hispanic and Latino poetry and plays, while promoting children’s theatre, producing the works of New Mexico playwrights, and celebrating the history, richness and diversity of New Mexico's many cultures and artistic talent. Warehouse 21 has a 100 seat black box theatre available for rent, featuring a large stage and spacious green room. The building is an arts, media, and entertainment community center, serves young people through mentorship opportunities in the arts and encourages all ages community engagement by combining collaborative resources. It is Wise Fool New Mexico’s mission to ignite imagination, build community, and promote social justice through performances and hands-on experiences in the arts of circus, puppetry, and theatre. The Santa Fe Woman’s Club & Library Association was founded in 1892 as the Woman’s Board of Trade. They established the Santa Fe Library and for many years the Club maintained the Fairview Cemetery. The SFWC was named a Santa Fe Living Treasure in 2003. Membership meetings are held monthly except during July and August with a luncheon and speaker. An annual flea market is held in October with other fund raisers during the year. Monies raised support the Club’s philanthropic efforts for women and children in the community.